He’s a member of the Justice League, has just celebrated his 75th Anniversary and will soon get his own feature film, and yet you still don’t hear too many people talking about Aquaman. That’s a shame because as his many fans know, Aquaman is one of the most interesting, creatively rich characters in the DC Universe. He’s both a super hero and a king—two roles that are often dynamically at odds with each other. He has a fiery paramour who comes from a shunned segment of Atlantis. And he can wield sharks as weapons! Plus, his current series is stronger and more relevant than it’s been in recent memory, with global stakes and some of the best action we’ve seen this past year. Hopefully, you’re reading it, but if for some reason you’re not, it’s now easier than ever to get caught up. AQUAMAN VOL. 1: THE DROWNING is out in comic shops and will be available in traditional bookstores worldwide on Tuesday. It features the first six issues of Aquaman’s ongoing series, plus the Rebirth one-shot, which is more than enough to make you a fan. But if you need further reasoning, read on! 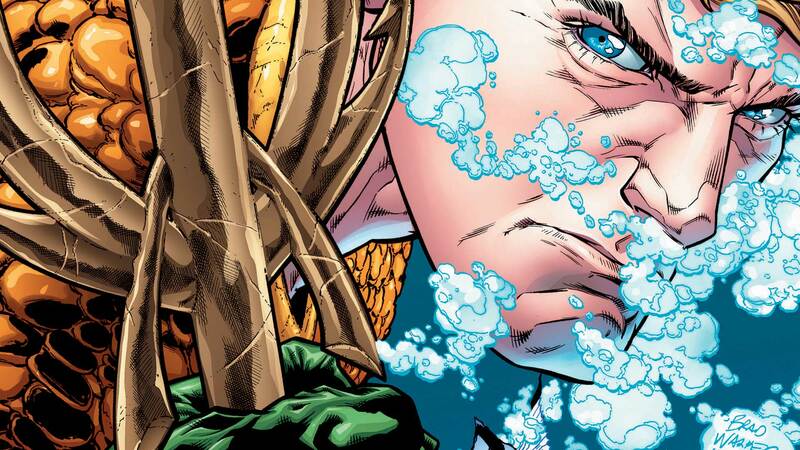 We have three solid reasons why you REALLY need to be reading Aquaman. Rebirth is all about returning our heroes to their roots, so it’s not surprising to hear that Black Manta is Aquaman’s core adversary in his series. But while most comics might put off the big battle between our hero and villain until the final act of the story, writer Dan Abnett and artists Scot Eaton, Brad Walker and Philippe Briones stage the big skirmish fairly early on, in the first half of the collection. What’s more, this comes after a fight between Arthur and members of the Deluge, a sect of Atlantean terrorists, and a dramatic bombing of Atlantis’ brand new embassy. It would be easy to think that Abnett is jumping the gun, not taking the time that’s necessary to build up to an exciting climax, but give him the benefit of the doubt. Without spoiling why, it turns out it’s necessary to stage the fight early to give Manta even more animosity towards Arthur along with a deeper motive than simple revenge. It sets the greater plot in motion, which turns out to be a surprisingly complex one that’s large in both scope and scale. A frequent theme in Aquaman comics is the mistrust between Atlantis and the surface world. However, Abnett has given it a fresh coat of relevance by presenting Atlantis as a kingdom in turmoil where most of the population doesn’t much care for the world above or their American-born king. Dissidents are everywhere, along with groups like the Deluge, who are ready to take extreme action against the surface world for what it sees as a continuous assault on planet’s seas. As a result, Arthur is placed in the impossible position of pushing for peace when the desire for war is prevalent on all sides. Arthur’s drive for peace is seen as a betrayal by many of those he rules, and his association with Atlantis is a source of mistrust between him and the American government. In short, he’s operating in a powder keg, and Black Manta proves to be the match. But this isn’t a war story. Not so far, at least. Instead, it’s more interested in the breakdown of peace. It looks at how small actions can spiral out of control, how often the only thing preventing an all out war is the action of one or two individuals…and how that’s not always enough. Startling parallels to the real world abound, but Aquaman is never heavy handed and never less than thrilling. Also, while so far the series has largely focused on Arthur’s role as the King of Atlantis, it hasn’t neglected his spot on the Justice League. In fact, it has some interesting things to say about that as well. Fights between heroes are common in comics, but this one feels particularly harsh in light of all that Aquaman has been through to this point, and how up until now he’s avoided responding with force. But perhaps it shouldn’t be so surprising. As Arthur makes clear to the Man of Steel, when it comes to the Justice League, he’s always felt like a black sheep. It says something that Superman is the hero that Aquaman has this fight and this exchange with. As Mera points out later on—they’re both sons of other worlds. We’re left wondering, if Superman, the “big blue boy scout,” feels this way about Aquaman, how do Wonder Woman and Batman feel? Aquaman’s people don’t trust him. His home on the surface doesn’t trust him. Even his closest friends don’t seem to trust him. Other than Mera and a handful of regents, he is truly alone in trying to prevent a war that could most likely destroy the world. It’s dramatic, gripping stuff that’s worthy of conversation. So if you haven’t been reading Aquaman, it’s time to start. Because as those of us who have been reading the comic can tell you, as good as the first volume is, things only get better from here.